Visual Arts is an opportunity for creative expression where students explore their creativity through a variety of hands-on activities, materials, techniques, art appreciation, history, and cross-curricular projects. Spanish is taught in Sixth Grade once per week and in grades 7 and 8 twice per week. Students are also introduced briefly to Italian culture in grades 7 and 8. Students in Eighth Grade will practice the skills used to successfully complete the high school placement test that takes place in early December. The resources include a test preparation book from Peterson's to help students determine their strengths and weaknesses. This book covers all test formats, test scoring, and types of questions, including expert tips that guide students through verbal and quantitative exercises. Grades 4 to 8 may pay to enroll in an independent instrumental music program. All lessons take place during the school day. The Reading program provides skills instruction in decoding, vocabulary, comprehension, as well as life and study skills. Instructional activities before, during, and after reading help students integrate and apply their skills. The result is a comprehensive program that offers explicit strategies to teach students to comprehend our written language. A reading resource teacher is available for grades 1-8. A more intense focus on literature is presented at the Middle School level. Children in grades 6, 7, and 8 have a vocabulary course designed to increase their knowledge of and proficiency in the English language. Students in grades 1 through 5 are taught cursive writing using A Reason for Writing series. All assignments in grades 3 through 8 will be completed in cursive writing. Every class has a scheduled library period weekly. According to grade level, students check out books, learn library skills, and do research projects. The library also has open periods that allow teachers to schedule a particular class for research or for individual students to do research work. Computers are available in the library for independent and small group research. In order to allow teachers to meet students’ individual needs in mathematics instruction, students in grades 2 through 8 are placed into math groups. Pre-algebra and algebra are taught in 7th and 8th grade, offering two levels per grade, appropriate to the individual student’s abilities. Seventh grade students will receive the standard math curriculum or be challenged with Pre-Algebra. Eighth grade students will receive the standard curriculum (Pre-Algebra) or be challenged with Algebra 1. Access to technology programs in the computer lab provides extra skills practice. Online reinforcement is utilized as well, primarily through IXL Learning. Kindergarten through Fifth Grade use Envision Math Series. Sixth through Eighth Grades use Pearson Middle School Common Core Series. A math specialist is available five days per week to allow homogeneous grouping in Math for grades 3 through 8. Accelerated math groups are taught pre-algebra and algebra in grades 7 and 8. Students preschool - 8 attend weekly music classes, taught by a music specialist. Through sequential curriculum activities, they develop singing and listening skills. Students learn to interpret musical notation and study music history through various activities. Many different aspects of music are addressed and taught throughout the year, including preparations for occasional performances. A qualified physical education teacher provides a complete physical fitness-oriented curriculum. Curriculum is designed to meet the expectations of all ages, grades pre-school to 8, with a combination of sports, dance, exercise and other elements of physical fitness. Every grade participates in a weekly class. Liturgical services are held for the entire school community every Friday and/or on Holy Days of Obligation, class liturgies, and prayer services. Other devotions include the Stations of the Cross, Eucharistic Adoration, and the May Procession. Students have the opportunity to receive the Sacrament of Reconciliation two times a year. The Religion program is designed to provide a holistic approach with graduated learning experiences from preschool to grade 8. Children prepare and participate in weekly liturgies. Children in grade 2 prepare for the Sacraments of Penance and Holy Eucharist. 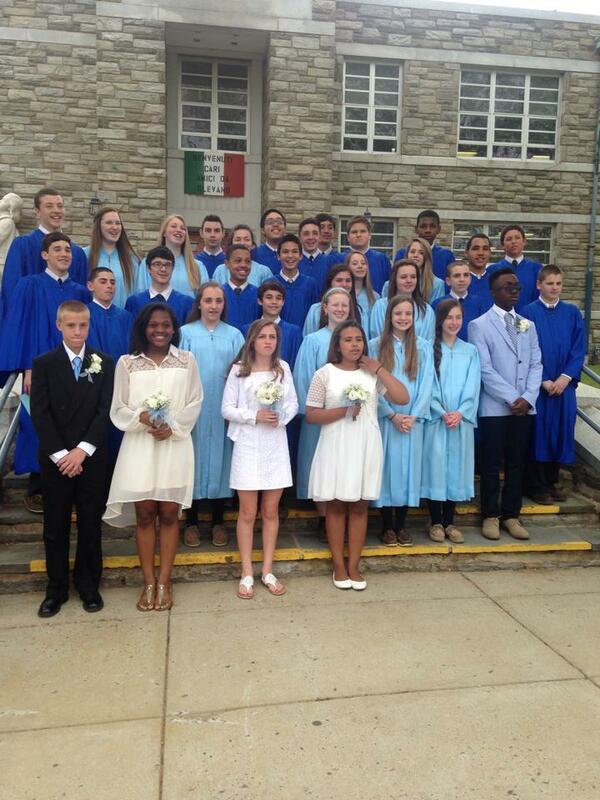 Students in grade 7 begin preparation for the Sacrament of Confirmation to be completed and received in grade 8. Sacramental preparation includes the involvement of parents, students, teachers, clergy and the total parish community. Parents are required to be active partners in the preparation of their children for the sacraments of Reconciliation, Eucharist, and Confirmation. These sacraments are only conferred on students baptized in the Roman Catholic tradition. It is expected that parents nurture the sacramental life of their children by ensuring their weekly attendance at Sunday Mass. A fully equipped state-of-the-art science lab is utilized by students from preschool through eighth grade. This Science program presents opportunities for learning the scientific method and process skills through experiments and hands-on activities. Science concepts are enriched through cross-curricular links and appropriate books related to science topics. Interest in various science areas is enhanced through computer software. These computer programs allow for the implementation of critical thinking skills and the application of the scientific method. The social studies curriculum provides the opportunity for each to student to acquire knowledge and develop skills necessary for social, political, and economic participation in a diverse, interdependent, and changing world. As our program is implemented in preschool through grade 8, students build their understanding of the past, people of different communities and regions, our nation, and the world. Geography is integrated in all grades with a strong emphasis on map and globe skills. Middle school uses the Holt McDougal (Houghton Mifflin Harcourt) Series, U.S. History. This series was purchased in 2012 with an online component as an added feature. Weekly computer skills classes offer students the opportunity to enhance the language arts and math curriculum in grades pre-school through 3. Students in grades 4 through 8 begin an intensive keyboarding program. Grades 5 through 8 concentrate on working with graphics and using applications in Microsoft Office, such as word processing, spreadsheets, databases, and PowerPoint presentations. To meet the needs of an ever-changing, ever-increasing technological world, guidance regarding Internet usage and responsibilities is presented and discussed. All classrooms are equipped with SMART boards. The Computer Lab is available for all to use and there are PCs in all classrooms so that students can access technology to complete assignments.